Summary: Harriet Powers was born into slavery in Athens, Georgia. She grew up on a cotton plantation, watching women spin, dye, and weave cloth. 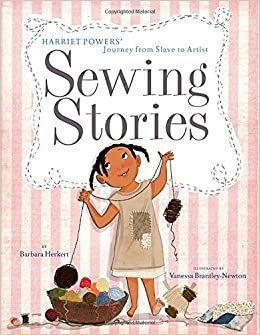 She participated in quilting bees, where slave women were given a few hours to sew their own creations instead of having to follow directions of the mistress of the house. At one of those bees, she met the man who would become her husband. They married and had five children; when the children were still young, the family received word of the Emancipation Proclamation and were free. Harriet and her husband worked hard and saved enough money to buy a small farm. When the price of cotton dropped, Harriet was forced to sell two of her beautiful story quilts. One of them was purchased by an art teacher who wrote down the stories pictured in the different quilt panels. An author’s note explains that those two quilts still exist today, in the National Museum of American History in Washington, DC and the Museum of Fine Arts in Boston. Other back matter includes a bibliography, photos of the two quilts with a list of the stories portrayed on each, and the only known photograph of Harriet in existence. 40 pages; grades K-3. Pros: The beautiful quilts are evidence that art can flourish in any environment. The illustrations capture Harriet’s spirit as well as her works of art. 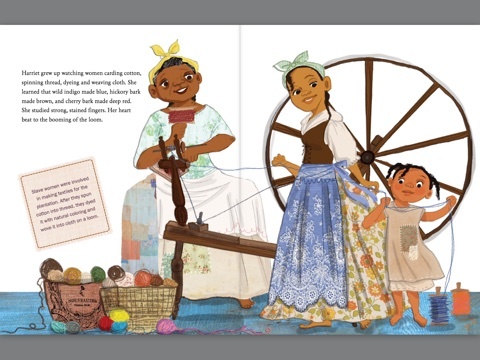 Cons: I hesitate to enter into the controversy over the depiction of slavery in A Fine Dessert, but two of the criticisms I have seen—that the portrayal of a slave girl living with her mother is unrealistic, and that the slave girl shouldn’t be pictured with a smile—are present in this book as well. So far, I’m not aware of similar criticisms for Sewing Stories.